Plowing is a necessary action taken by farmers to prepare for new crops of the upcoming season. Before modern tractors, horses would pull the plow to prepare the ground for planting. Today, tractors are used to pull the plow. 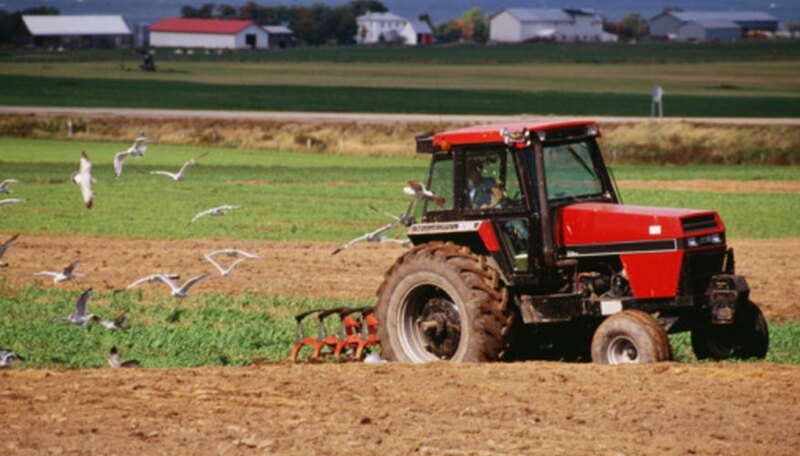 The purpose of plowing a field is to overturn the soil to cultivate it and kill the weeds that may damage young crops. Plowing requires precision and patience as to not ruin your equipment while cultivating the soil. Connect a powerful tractor to the plow. Ensure that both pieces of equipment are in good working order. The plowshare will cut the soil. The soil is raised and broken up by the plowshare blade. Start the tractor engine and proceed to the furthest end of the field. Lift the plow during travel. This will be your starting point. Lower the plow to the ground. Drive the tractor down the field in a straight line to the opposite end of the field. Turn the tractor to line up the blades and begin a new pass directly beside the first one. Watch for obstructions including rocks, trees and gullies. Repeat the passes by driving up and down the field in straight lines, always turning and driving directly next to the last past. Maintain the same speed or RPM (revolutions per minute) and gear. Remove the plow from the tractor when you are done with plowing the entire field. Attach the disc, or harrow, to the tractor. This piece of equipment is used to break up any large soil clumps and will prepare the ground for the planting of crops. Attach the tractor to the plow. Pick up the plow and drive the tractor back to your original starting point. Go over the entire field again using the disc, making the same passes directly next to one another. Look in the instruction manual that came with your tractor or talk to the dealership in which you purchased the equipment. Determine the best RPM and gear for your specific tractor width and size. This will prevent long-term wear on the equipment. Take precautions when working with plowing equipment. Always pay close attention to the area around you to prevent injury to yourself or damage to your equipment.